PEAR is the PHP Extension and Application Repository, and is a framework and distribution system for reusable, high-quality PHP components, available in the form of "packages". 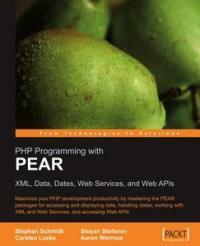 In this book, you will learn how to use a number of the most powerful PEAR packages available to boost your PHP development productivity. By focusing on these packages for key development activities, this book is an in-depth guide to getting the most from these powerful coding resources.